As is par for the course for us in January, we spent the weekend with the whales. We ran a lot of cruises…here are a few highlights. On Friday’s Wake up with the Whales, we watched one pod of 2 and another pod of 3 Humpbacks surfacing, spouting, and sounding multiple times…and had lots of great views of their flukes. On Friday’s Mid-Morning Cruise, we found baby Humpback rolling around on Mom’s huge rostrum (head). We also got to see baby’s pec flippers a few times, and watched him do a complete breach. We found the same Mom/Baby pod during our Private Whale Watch Cruise on Friday. This time we got to see Mom breach 3 times, and baby breached too many times to count. Towards the end of the cruise, a little grey zodiac approached the duo…Mom wasn’t having it, and aimed a couple of peduncle throws in their direction. By the time our Whales & Cocktails Cruise departed on Friday, it must have been resting time for the Humpbacks. We saw at least 5 different whales, but all of them had extremely long bottom times (30 minutes or more). 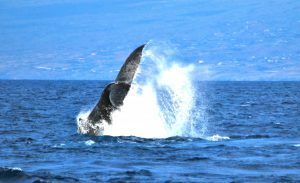 On Saturday’s Wake up with the Whales Cruise we had to keep our heads on a swivel as we spent most of our time between two pods of two Humpbacks who were surfacing, spouting and sounding giving us great views of their flukes. Saturday’s Mid-Morning Cruise began with sightings of a pod of Spinner Dolphins who were hanging out right at the entrance to the harbor. We also saw spouts and flukes from a few whales a couple of miles out. But the highlight of the cruise was listening to a singer through our hydrophone. He was so close and so loud that he almost blew out our speakers! Is “Breachtastic” a word? If not, we’re coining it now to describe the experience we had on Saturday’s Snorkel and Whale Watch Adventure Cruise. We came across two sub-adults who breached non-stop for about an hour (we lost count after 20 breaches). We had the boat in idle, but the wind was so strong it was pushing us right along…and these two whales kept up with us breaching right along side…we even tried to leave them to go snorkeling, but every time we put the boat in gear, one of them would breach again (and we just can’t drive away from that kind of action). All of our Sunday Cruises operated out of Anaeho’omalu Bay. We saw lots of spouts and flukes and actually had several close encounters with Humpbacks approaching us, but the highlight of the day was watching a pod of two whales who were interacting in some weird way right under the surface. Guest from both Seasmoke and Manu Iwa got to see the water kind of rolling right before both whales breached…and then one of them shot vertically out of the water for another spectacular breach. Ocean Sports Whale Fact of the Day: Humpback Whales have massive tongues. An 80,000 pound Humpback has a two-ton tongue! If you had a similarly proportioned tongue, and you weighed 150 lbs, your tongue would weigh 7.5 lbs (in actuality yours weighs around 3.5 ounces).